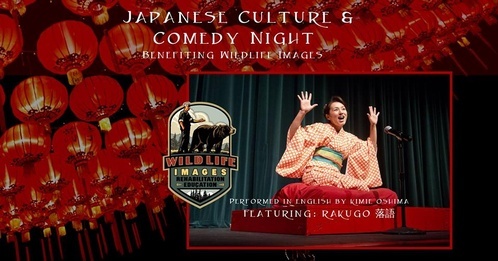 Come immerse yourself in a night of Japanese Culture & Comedy benefiting Wildlife Images. Worldwide performer Kimie Oshima will keep you laughing with her traditional Japanese storytelling and comedy, Rakugo. Performed in English, this is an incredible opportunity to learn about another culture while enjoying a night for the whole family. Plus, meet Wildlife Images Animal Ambassadors up close and personal! Available online (soon! ), at Wildlife Images, or at the door.